Courtesy of Jaguar Land Rover's Special Operations department, we'll be seeing three cars: the Range Rover Sport SVR, the Jaguar C-X75 and the Land Rover Defender Big Foot. The SVR set a new record last year. At 8 minutes and 14 seconds, it is the fastest production SUV to ever lap the Nurburgring. And it's no wonder, when it has 543bhp to tap into. We're fully expecting a few of these to be in the hands of some suitably useless henchmen, in jet black naturally. Which probably means a grizzly end for the speedy SUV. Shame. This first debuted in Paris back in 2010, but Jaguar sadly cancelled the production version. It looks like the kept the concept car on ice for a suitable owner, and they've found one in Bond's latest nemesis who will rag the C-X75 through Rome in a car chase with Bond. This carbon fibre beast is "the finest looking and most innovative Jaguar ever created,” according to Jaguar head designer Ian Callum, and the hybrid engine - with turbocharger and supercharger - puts out 850bhp. Yikes. 2015 is the final year of the Defender, ladies and gentlemen. 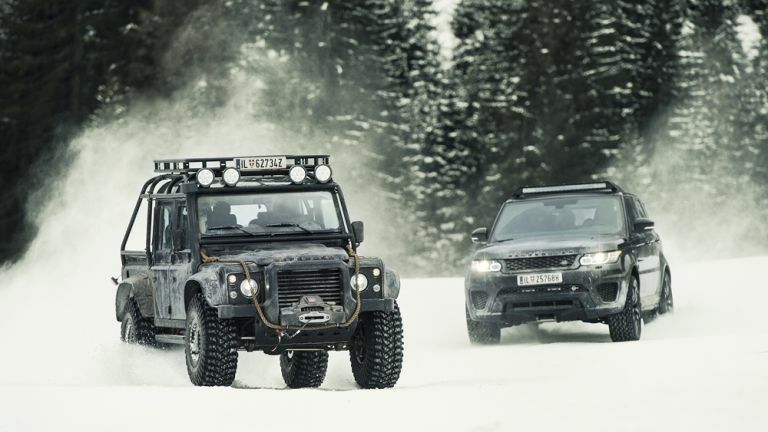 In December, Land Rover will stop making the iconic 4x4 so we're glad that it'll get a last hurrah courtesy of Bond and the Austrian Alps. The Big Foot is packed with modifications to deal with bad weather - particularly snow - including massive 37-inch off-road tires. The Defender is pretty villainous, but here's hoping Bond gets to see it off in style.